This is Lis Simon Bride Nicole, who is wearing our Jodene gown and looks absolutely amazing! Colby and Nicole met through mutual friends, and actually stood by them on their wedding day in November of 2017. Read on for their full love story! It was mid-March and Nicole was having a rough day. She had spent the afternoon venting to one of her close friends, Carley, who encouraged Nicole to meet her and her boyfriend at Katy Trail Ice House, a local bar, and watch the Oklahoma State basketball game to relax. Meanwhile, Colby had a whirlwind investment pitch on a project go south and was on his way back to Texas from Chicago. Upon landing, he texted Chad, who was Carley’s boyfriend, to meet up from a drink later. Chad invited him out to Katy Trail Ice House. Nicole is usually a very outspoke person and not usually afraid of speaking her mind, however, something about Colby’s demeanour paired with his strikingly handsome face had Nicole completely speechless. Colby spent the rest of the night trying different smooth pickup lines and occasionally rubbing her knee under the table while she consistently (but flirtatiously) reject him. After months of playing hard to get and weekly flirting over beers and people watching back at Katy Trail, they became a “summer fling” and have become inseparable ever since. Colby is a very determined, driven person and is a natural leader. He never gives up, is always striving and achieving new goals, and is a strong, trusted leader among both his friends and colleagues. Who knew those assertive actions at the bar when they first met would be the same traits Nicole admires his the most for. Colby and Nicole were on vacation in South Africa about to leave for their evening safari. They had just arrived in Kamaku Lodges where they were greeted with over 100 elephants, her favourite animal. After spending some time in awe, just looking at the wild elephants just feet away from her, their tour guide sent them to their room to change for their safari. Nicole was just about to put her shoes on when Colby asked her to step outside because he had a present for her. She waited on their patio, honestly just hoping he was going to surprise her with the boots she had wanted before the trip. When he told her to turn around, he was down on one knee. Nicole was completely speechless she almost forgot to say yes. Nicole had originally purchased a very simple solid white dress from Nordstrom. Nothing over the top. She was planning an elopement after all and wanted a very classy, timeless dress. Since they weren’t inviting friends or family to their ceremony, she decided she would still book appointments with local boutiques to giver her mom, mother-in-law, sisters, and sister-in-law the dress shopping experience, but she had no intention to actually buy a dress. Their first reservation was at Blue Bridal Boutique. Katie greeted them with a big smile, listened to Nicole’s wants/needs, then let them walk around the showroom marking dresses they’d like Nicole to try on. Katie brought out our Jodene gown out as one of her suggestions. As soon as Nicole put it on, she was in love and the tears started flowing. She decided it was the perfect dress for her and her idea of a ‘solid simple wedding dress’ was long gone. The dress was elegant and made her feel like a real bride. She knew she had to have it. Throughout the whole process, Katie was encouraging, understanding, and gave honest feedback and advice. She made the decision making very black and white, which really helped! 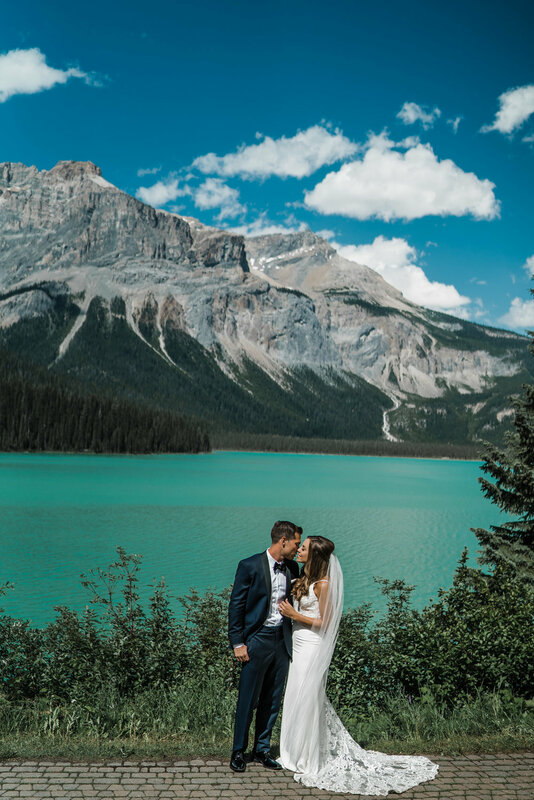 Colby and Nicole eloped at Emerald Lake Lodge in Field, British Columbia, Canada on July 20th in 2018. The day was more perfect that Nicole had ever imagined. Being very Type A, she had a hard time letting go of the planning responsibility and understanding the day would be mostly unplanned. While we had the date planned and the photographers and marriage commissioner booked, they weren’t positive what time the ceremony would be due to weather and she still had no idea what the cake or her bouquet would look like. They started the day with breakfast together overlooking the lake. Shortly after breakfast we met with the lodge’s coordinator to discuss the cake and when the flowers would be delivered. Trying to stay stress-free, they took off to sit in the hot tub and sauna for a couple hours. On our way back to the room after a good sweat we ran into our amazing photographers Mark & Tracey Crown. They were there early shooting B-roll for their wedding video. They quickly chatted then parted ways to get ready for the ceremony. Around 3pm, they received a call from their marriage commissioner that she was there and ready. Fortunately, the dark clouds had passed and their ceremony would be rain free. Soon after, they started our short walk to exchange their vows on the viewing deck. Their ceremony was held at Emerald Lake Lodge’s Viewing Deck overlooking Emerald Lake that lasted about 15 minutes. They celebrated with a champagne toast and bite of cake, then took off with Mark and Tracey for an afternoon of photos in the Rockies. It was great and they captured some incredible pictures as they laughed together and shared wedding stories, movie quotes, and Amazon Prime recommendations. It was an amazing day – focused on nothing but their love for each other. They did elope, but still wanted to share the day with their friends and family. They hosted a Happily Ever After reception in Austin about a month after they eloped. About 75 of their closest friends and family joined them for cocktails and jazz/blues/soul music to celebrate their marriage. They also shared their wedding video and pictures from the ceremony for the first time. It was a huge hit and really helped everyone feel included. Why did you choose to elope? 1. Exchanging our vows. We decided to write our own and although I was very nervous, I love them! 2. Mark and Tracey, our photographers who we met day-of. They are incredible people and very talented. They encouraged and laughed with us all day. Do you have any tips or trick for future bride? Thank you Nicole for answering all our questions! We wish you and Colby and happy, beautiful life. Hair & Makeup // Nicole did her own hair and makeup!